How Tall Do Sunflowers Grow? With its vividly yellow flowers that resemble the bright sun, few plants are more cheerful and inviting in a home garden than the sunflower (Helianthus spp.). But if you think a sunflower is always an extra-tall plant that only works in the rear of a bed or along a fence, you haven't encountered the many sunflower varieties that come in different sizes -- some with flowers that aren't even yellow. The common sunflower (Helianthus annuus) that grows as an annual plant in all parts of the United States is one of the tallest sunflower plants, becoming up to 12 feet tall when fully grown, depending on the exact cultivar. For example, a variety called "Russian Giant" can become at least 12 feet tall. Like most varieties, its bright green leaves are simple and pointed ovals, and have fine surface hairs. Because of its height, the plant does best when sheltered from wind and also benefits from being tied to a stake or other support that's driven into the ground. Some tall sunflowers grow as herbaceous perennials, dying to the ground in winter but returning in spring. The sawtooth sunflower ("Helianthus grosse-serratus") belongs to this group, growing in U.S. Department of Agriculture plant hardiness zones 4 through 7. 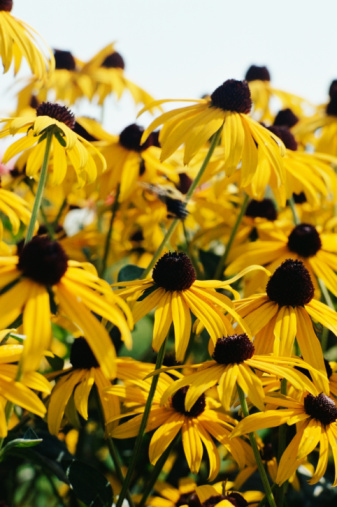 It becomes 6 to 10 feet tall, requires full sun and has daisylike yellow flowers in summer through fall. Some sunflower varieties are modest in height, making them adaptable to the middle of a border or good for mixed plantings with outer plants of similar size. For example, the woodland sunflower (Helianthus divaricatus) is an American native perennial that grows in USDA zones 3 through 8. It prefers partial shade and can be only 2 feet tall, although some plants can reach 6 feet. Some cultivars of the annual sunflower have been bred for a smaller size. These include one called "Autumn Beauty," which is about 5 feet tall. Its flowers have mahogany, bronze or brownish-red petals. "Frilly Hybrid" is another variety that gets its name from its frilly yellow petals. It's about 5 feet tall, and its flowers have dark brown central disks, like most sunflowers. Several annual sunflower varieties are especially short, making them adaptable to many spots in a garden, such as in the front of a border. One cultivar called "Teddy Bear" is only about 3 feet tall, with double yellow flowerheads that resemble chrysanthemums, while "Sunspot" is even shorter, only about 2 feet tall, but has 10-inch-wide flowers. A few annual sunflowers have other unusual features that make them standouts. For example, a variety called "Italian White" has flowers with white petals and black central disks, while a cultivar called "Holiday" branches as it grows, producing an especially large number of yellow sunflowers. Sunflower plants generally do best when grown in full sun, which promotes heavy flowering. They grow in any type of garden soil, and smaller varieties also do well planted in potting soil in outdoor containers. Annual types are frost-sensitive and shouldn't be planted until the danger of frost has passed. Perennials can be planted in spring or fall and flower in summer-to-fall when spring-planted. What Is the Difference Between the Dogwood Tree & the Magnolia?